Natural gloss finish dreadnought acoustic with solid stika spruce top, plywood mahogany back and sides, Ovankol fingerboard, and tortoise shell pickguard. The Washburn Heritage Series encompasses the strong Washburn tradition of providing a truly superb instrument at a working musician’s price. They are available in dreadnought, folk, grand auditorium and jumbo styles. All models have a Ovankol fingerboard and bridge, diecast tuners for quick, easy and accurate tuning, a Washburn tortoise shell pickguard and a custom sound hole rosette. Selected models are also available with cutaways for superb upper fret access and a Fishman 301T Tuner/Preamp for natural amplified tone. 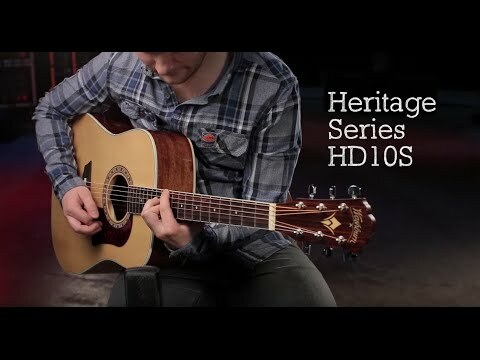 The HD10SLH is the left handed version of our HD10S dreadnought acoustic guitar. It features a solid spruce top for superior tone that improves with age, mahogany back, sides and neck, a Ovankol fingerboard and bridge, die-cast tuners for quick, easy and accurate tuning, a Washburn tortoise pick guard and a custom rosette. The HD10SLH is the perfect guitar for strumming, picking some blues or bluegrass flat-picking. It works well in group situations and is ideal for performing or recording.